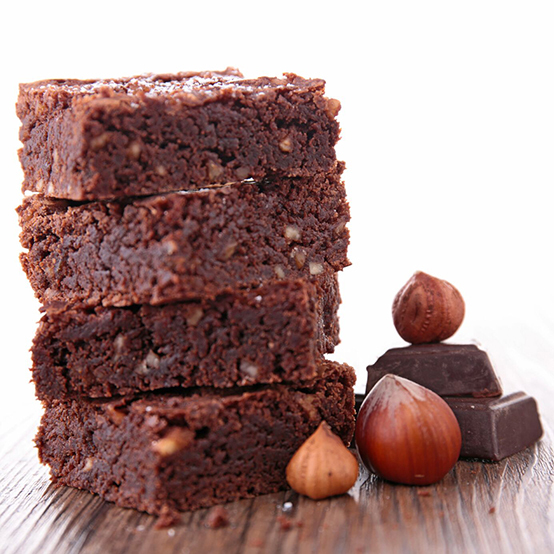 Give your kids a sweet kiss back to school with our Baci Brownies. It’s an A++ recipe sure to move you to the head of the class! Butter and dust with flour an 8-inch square baking dish. Set aside. In a mixing bowl, sift together the sugar, flour, salt and set aside. In a small saucepan, melt chocolate pieces on low heat. Stir constantly. Add syrup and stir well. Remove from heat and stir in butter. Add vanilla and eggs; mix thoroughly. Add this to the chocolate mixture then stir in chopped hazelnuts. Mix well with a spatula. Add chocolate mixture to dry ingredients and incorporate well with a spatula. Pour the batter into the prepared baking dish. Cook for 25-30 minutes. Remove from oven and allow brownies to cool completely. Cut into inch squares. Brownies can be stored for a week in an airtight container. For couture alternatives, substitute different kinds of chocolate and exclude all nuts in case guests have allergies. Some favorites are Scharffen Berger, Green & Black’s Organic Maya Gold, Williams-Sonoma Peppermint Bark and Chuao Chinita Nibs Dark Chocolate bar.